It’s there. It’s waiting for you. All week long the best golfers in the world think about one hole. When the best players in the world come together in Florida once a year to play The Players Championship the talk is all about the course. For the entire week the players are subject to endless discussion and coverage about one thing – the famous 17th hole at the TPC at Sawgrass. If you watch golf you know the hole. It’s an island green out in the middle of a manmade lake. For days the media discusses the famous shots at the hole. They talk about a few of the positive moments – the holes in one, the long putts made, the pivotal moments where great players withstood the difficult mind game and won the tournament. And then there is the endless discussion about the negative side of 17. The hole has claimed countless victims during the history of the tournament. Every year it seems the tournament is won or lost on the hole. Just looking at the scorecard you wouldn’t give much notice to a 130 yard Par 3 with a relatively large green. But put the green in the middle of acres of water and it messes with the players’ minds. And if that isn’t enough the players have to walk from the previos hole along the water a good distance before they reach the tee box on 17. It’s a true test of mental toughness and even the best can’t help, but to think about this storied hole. You may be wondering by this point and if you’re still reading I thank you – the point of this article is you have to make your company stand out in the mind’s of your customers just like the 17th hole at Sawgrass. You have to be what they think about when they think about your industry. When people choose to golf they have hundreds of thousands of options, but every year people flock to Sawgrass for one reason – it has a unique story. By accident the story of Sawgrass was created. Pete Dye designed the course and the hole originally started out with a peninsula design. As construction on the hole began the crew realized there was a lot of good Earth around the area where the Par 3 17th hole was going to be. By the time the crew got done moving the Earth around for the rest of the course the designer realized there wasn’t much left. Then his wife had an idea – why not create an island green? Genius. And it happened by accident. On rare occasions people get lucky and the story comes from unplanned circumstances. Your company may not be as lucky. It’s your job, however, to create the story your customers will talk about. When it comes to your industry there are likely countless competitors for you customers to choose from. What is going to make your offering unique? What is going to make you stand out in the customer’s mind? What is your company story? Call it a mission statement. Call it a vision statement. Call it whatever you want. Your company needs a story to go along with its product or service. Sometimes it isn’t only about the quality of the product. Yes, in a perfect world it should be, but in the real world customers are influenced by marketing. Sometimes the one with the best story wins even if they’re product or service isn’t the best. Your company is deserving of success and a story can be the way to attract the attention (and dollars) from customers. Each year golfers from all over the world visit Sawgrass because they want a story to tell. They want to tell their buddies how they played the famous 17th Island Green. The story for your business can come from anywhere. In fact, everything your company does needs to be the story. The next question is likely – how do I tell my company’s story? In most cases company’s struggle to find their voice in the world. They blend in with the other businesses in the industry. If there isn’t a story to be told people don’t pay attention. This is where a company blog can help. A blog can be a platform for your story. A blog gives your company a voice. It can be a voice from anyone, but the voice is important. It’s important to the people reading. People are drawn to things in life. They are drawn to interesting things. They are drawn to stories. The story of the 17th hole at Sawgrass is that it’s unique. There is really nothing quite like it anywhere else in golf. In all the holes in all the world there is nothing like it. It’s a simple hole on paper, but add the water and even the best golfers in the world fold and they fold at the worst possible time. People want to share that story. They want to be part of that story. What makes your business something people want to share? What makes your business something people want to be part of? What makes your business something people think about when they’re brushing their teeth? When they’re driving to work will they be wondering about your company? It’s a tough finding the interesting story within your business, its products or services. A blog is one possible way to find the voice and tell the story of your business. I see it all the time in the blogosphere. A blogger creates a voice. They form strong opinions. They interpret life and as a result their followers think about them. The followers think about what the blogger’s opinion will be on a certain topic. They wonder what the blogger would do in certain situations. They may even wonder what products the blogger may offer to solve problems. 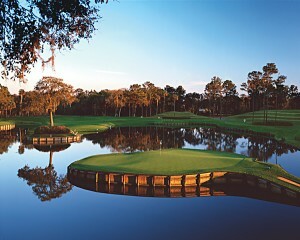 What makes you the 17th Hole at the TPC at Sawgrass?